If you are looking to drive sales through social platforms, then there is a simple solution. There's obviously a lot to think about when it comes to social. Even though having a brand presence on social has been around for a long time now, a lot of brands are still focusing on how many likes they have or how big their following is. Yes, having a large following might be an indicator of your success and reach, but a huge amount of page likes doesn't always translate into a successful social media presence or the ability to drive sales through social. Brands should stop thinking about gaining likes and start focusing on driving engagement through the production of valuable content. Consistently providing information that creates conversation, increases engagement, and keeps people coming back is far more valuable than a huge audience that is largely inactive. In many cases, your social media presence might not aim to generate direct sales at all. There are many brands that successfully use social as an engagement/loyalty tool, a customer service portal or simply a brand awareness platform and even if the aim is not to drive sales through social, having these foundations in place certainly makes it easier. The above are all valid reasons to use social media, especially if you have the budget to dedicate to this kind of activity. You heard me right. The days of you reaching any significant percentage of your audience for free is gone. There are the rare posts that "go viral" with little or no help, but these tend to be the exception rather than the rule. If you decide you want to be on a social media platform, you should probably dedicate some of your marketing budget to help it along the way. Social media should be treated with the same care as any other marketing tactic. It shouldn't be a last minute "oh sh*t, I need to post something" situation. If you want to drive sales through social, then getting the basics right first is imperative. What About Sales Through Social? Is it possible to drive sales through social media? The short answer is yes ... sometimes. Some business will find it easier to drive sales through social media directly than others and there a variety of reasons for this. If a brand has already built a relationship with their audience through organic content and good community management, it will be easier to drive sales through social for one simple reason. There is a level of trust. If somebody knows and trusts the brand, they will be much more comfortable clicking on a sales based post or ad and completing a purchase. Is it a considered purchase? A what? When I talk about a considered purchase, I basically mean cost. Large ticket items like cars, boats and planes are expensive. People will often spend weeks or months researching different models, brands and deals before committing to buying something that is very expensive or they intend to own for a long time. In these situations, a direct sale from social is not likely. 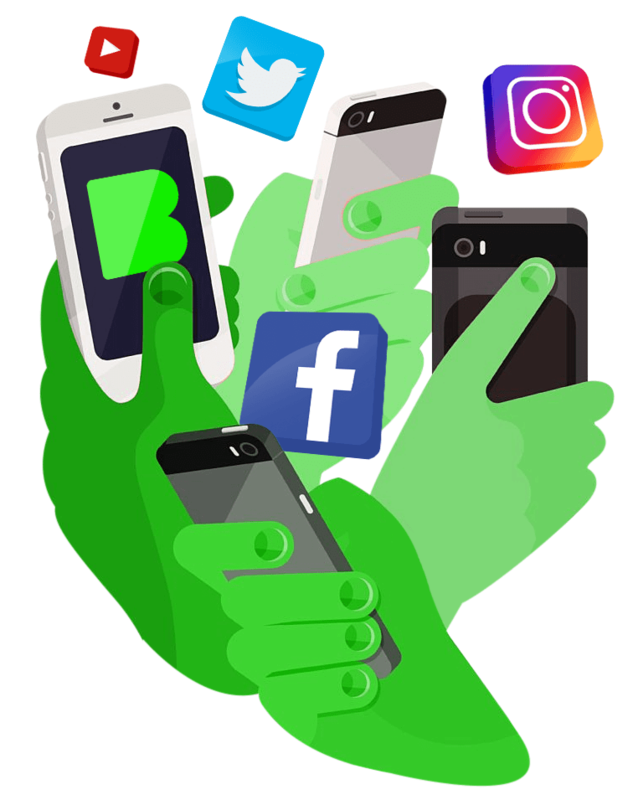 Social will certainly be a part of the purchase journey and should be within your marketing mix, however, it is only one customer touch point out of many and should be treated as such. In simple terms, are you selling to other businesses or are you selling directly to consumers? Business to business transactions usually require a more long-tail approach and being able to drive sales through social directly can be more difficult. This is where tactics like content marketing come into play i.e. you produce consistent content based around the industry you are in over a period of time that is aimed at the users you are trying to turn into leads. Small consumer sales can often happen on a whim (especially for low ticket items) which is where social can really come into it's own. How do I sell through social? Your aim is to get sales directly from social. Awesome. Clearly, you have done your homework and your business is thriving (if you don't have the above then get that in order first). Now you want to drive sales through social media and create a positive ROI (return on investment). I have just one recommendation. Remarketing is a tactic wherein you target users who have visited your site and viewed some products but did not make a purchase. Maybe they even went as far as adding it to the basket but got distracted and forgot how awesome your product is. Remarketing serves to remind them of what they are missing out on and give them a little nudge. What more could you ask for? Bareface are currently working with clients that spend as little as £400 on social media remarketing and it has provided them with around £15 for every £1 spent directly through social media. This is a great return by any standard, but it is especially impressive when you consider this sales that come directly from advertising on social. How does social media remarketing work? This might be difficult, but forget about Twitter, LinkedIn, Snapchat and Pinterest. I'm not saying they are not useful, but let's focus on Facebook and Instagram for a moment. For the purposes of this article, we will treat these two as the same platform. After all, Facebook owns Instagram and you can create ads for Insta directly through Facebook. Facebook makes this really easy for you. If you have a Facebook advertising account, they will create a "tracking pixel" for you that will allow Facebook to track the behaviour of users on your site. You can then create an audience in your advert account based on those behaviours. I could then create an ad about services relating to social media and choose to deliver that ad to this audience. You see, we have an active audience that knows who Bareface is, they are interested in social media as a service and might want some help. I feel a little bit like the masked magician at this point, revealing the dark secrets of advertisers, but this is all to help you. I promise. This is quite basic, manual remarketing. If you use a popular content management system like WordPress (using the Woocommerce plugin) or Magento, it is made even easier again. Both of these platforms have plugins available that allow you link directly into Facebook and automatically deliver ads to people based on the products they have viewed but not bought or display other products that may be interested in. 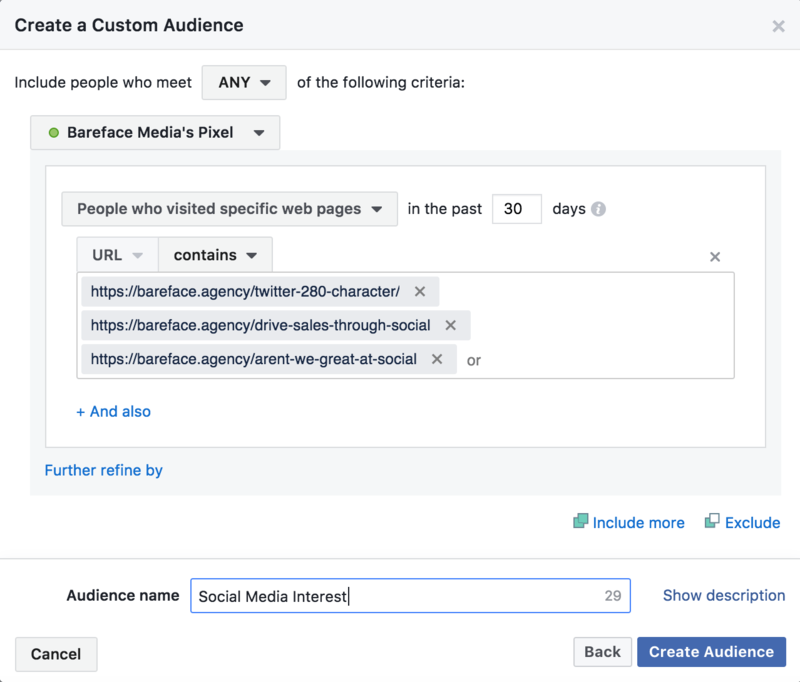 This essentially automates your remarketing so you can drive sales through social while you sit back with a nice cup of tea and binge watch some media content. Well, probably not but, it certainly means you can focus on getting quality traffic to your site through organic social, PPC, email and SEO etc. Like many things in marketing, setting this up is going to be the most difficult part. If you don't have any technical knowledge, the simple task of getting a tracking code in the correct place on your site can seem like a mountain to climb. If you have a website developer or marketing agency, simply make it their problem (or our problem). If you don't then there are lots of good tutorials on YouTube that can guide you through the process step by step. Putting in the effort initially will benefit you massively in the long run because once it is done, it requires little to no maintenance and continues to provide you with returns long into the future. If you have any questions on remarketing or how to drive sales through social, get in touch. Original post by Louis G Thompson, Head of Digital. Get the latest updates from Bareface by signing up using the form below.